Hey everyone! I hope you've had a good start to the week so far. Monday's aren't always the best days but mine wasn't too bad. 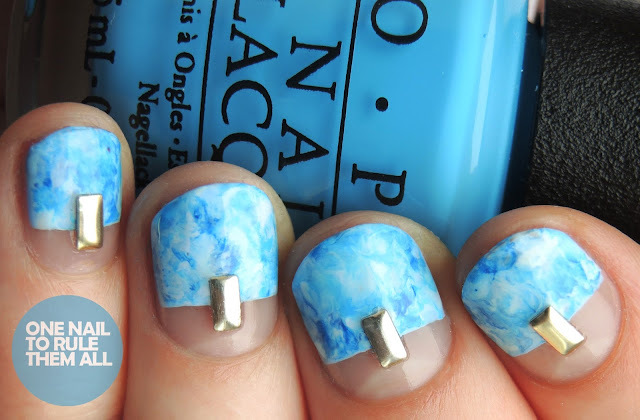 Today I've got a quick post with these blue marble nails. Is there a term for the new trend of half negative space nails? I feel like there should be if there isn't because "halved nails" sounds a bit rubbish so I just tend to stick with calling them negative space. Despite the lack of a name, I love this trend and there are so many different options (basically you could just cut any design in half) that I doubt I'll get bored anytime soon. Although I do try not to do it as much as I'd like because otherwise it might get a bit boring to read about! For this design I was struggling to think of a design as I was in 'swatching mode', and I saw a "halved" design on Instagram and knew that's what I wanted to do, so I just went where the design took me. I decided the combination of this and stamping marbling would work quite well, and I was really happy with the results. The base for these nails was OPI - The I's Have It*, from the Alice Through The Looking Glass collection. Then I used OPI - Fearlessly Alice* (also from the same collection), Barry M - Huckleberry, Barry M - Cobalt Blue (from their original nail paint collection years ago), and Barry M - Sugar Apple for the marble. The studs were given to me years ago by Very Emily so I don't know where they're from, but I would assume Born Pretty Store. Oh my gosh, these are so adorable! Mina is right, the pool effect is spot on and the addition of studs adds something extra special to this (already adorable) nail art. I am yet to try this half negative space technique! It's so fun. OHHH I love these. 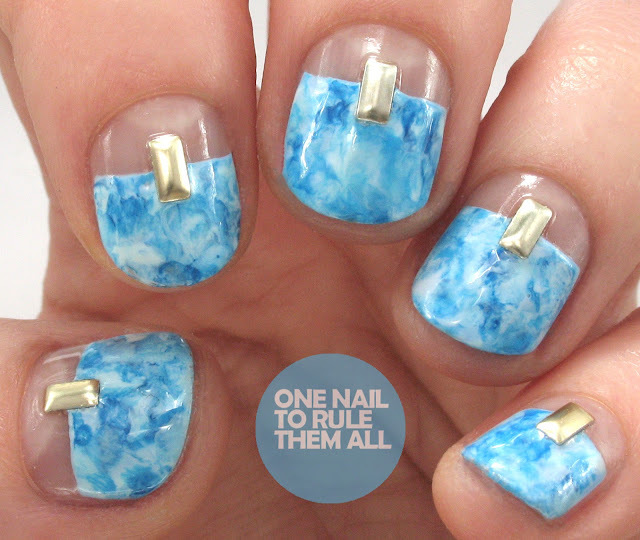 Everything about them is right on - from the negative space to the marbling to the 3D element! Aww haha I don't even remember giving you those studs but they look so cute and really finish off this design. 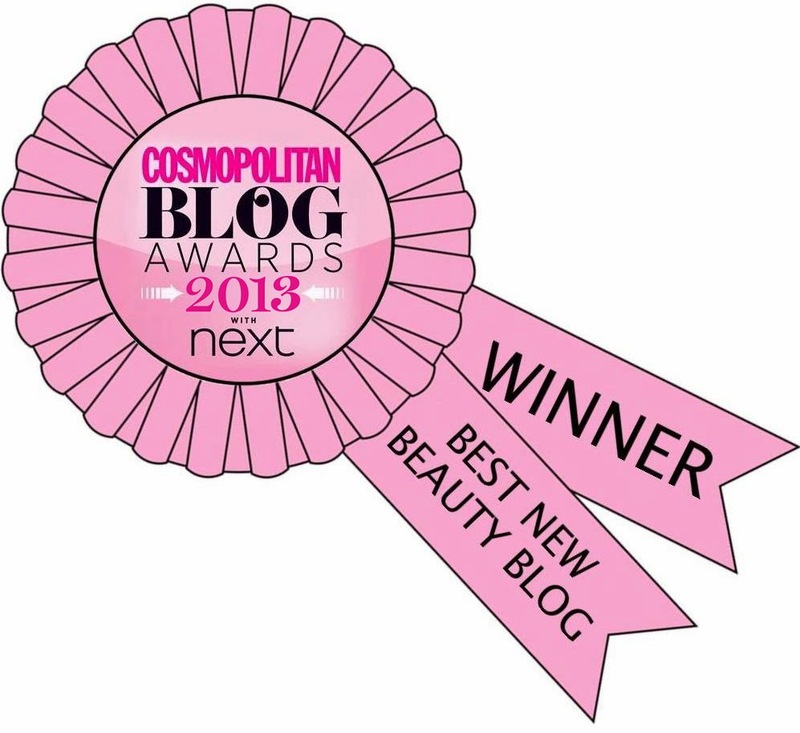 I am obsessed with this style of negative space too, maybe we could call them straight moons or straight bare moons?! LOL I'm still thinking! Love the blue marble, reminds me of a swimming pool! For some reason I'm always afraid to do negative space. You make it look so good! I love it with the studs.